Have a lovely day on the trails! Please remember they Love their family too! Leonardo, Donatello, Michelangelo or Raphael? When I was raising my son in the 80’s Teenage Mutant Ninja Turtles was a very popular cartoon. So when I saw this little guy my brain said “Leonardo, Donatello, Michelangelo or Raphael?” This is the first time I had seen a baby box turtle on the trail in the park. Best of all I know why this little being was there for us to see on our morning hike. Thirty seconds prior to my spotting our little ninja turtle we startled a hawk on the trail. As it flew away there was a muffled plunk sound. When we arrived on site a stunned little turtle was running for cover. They are a lot faster than their bigger counterparts. Witnessing all the chaos was a semi well hidden chipmunk (spotted by my husband). I got one photo and she was on her way. We have seen many large raptors this year on low branches, logs, and lifting off from the Forest floor. I would not stay out in the open long if I was a small being. Happy Trails ♫ ♪… and Love to ALL! Melting in the heat and humidity of the Rainforest is a cleansing experience. Toxins leave the body and Soul with each drenched step up the mountain side. I am bathed in the light rising up through the Trees as the sweet song of a Scarlet Tanager revives my Soul. Ever wonder if the Forest is looking back? 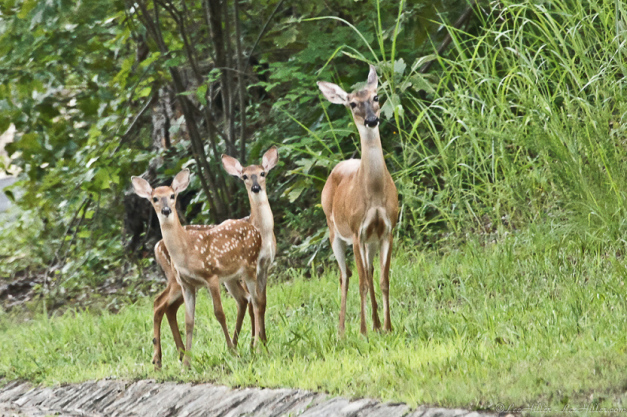 Check out the Whitetail Deer photobomb photographs. Even though I took clearer images of the second Deer it made me realize how much I likely miss when I am hiking. 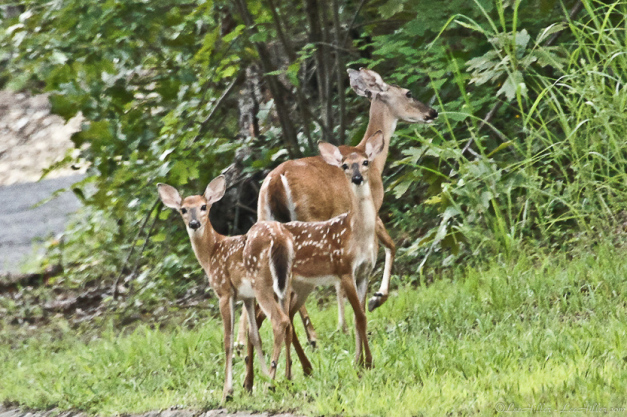 I think the Deer with the antlers is a doe not a buck based on size and herd group.